Arizona’s Senior Senator John McCain keeps losing more and more respect by the day. Recently, he made headlines by boldly claiming that President Obama was ‘directly responsible’ for the Orlando shootings. In trying to clarify his fallacious statement he completely forgot that it was George W. Bush who created the power vacuum in the Middle East by invading Iraq, which allowed not only Al-Qaeda to thrive but also allowed the ISIS movement to be born. Then McCain turned the ‘crazy’ knob to eleven and endorsed Donald Trump. If you remember, last year Trump questioned McCain’s war hero credentials and criticized McCain for getting captured. 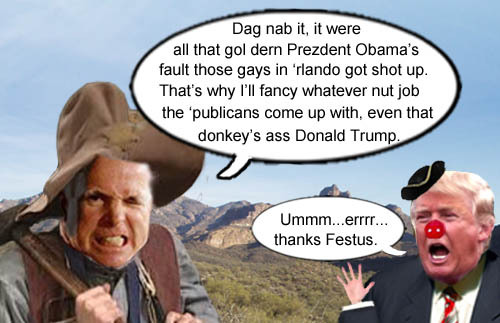 Now, almost a year later, McCain is going to endorse the man who insulted him. This (and his stubborn refusal to vote on a new Supreme Court justice) is apparently why support for his Democratic opponent, Ann Kirkpatrick has surged in recent polls, and even has her ahead in one. Our advice to Senator McCain(like he’s asking us): you’ve had a good run, but it’s time to retire to one of your seven or eight or twenty houses you own and start shooing kids off your lawn and away from your precious gold. We have no doubt you’ll be great at it. Arizona’s Senior Senator and crusty old coot, John McCain, demonstrates why he should retire from politics and start a successful new career of keeping kids off his lawn and away from his gold. From all accounts, Jeb Bush’s ship appears to be sinking in the farce that is Con-a-thon 2016. Not only have his performances been lackluster in the ridiculous GOP debates, but he seems to be completely delusional about his brother, George W. Bush’s tenure as President. Lead GOP clown, Donald Trump actually did something the spineless Democrats never could do; call Dubya out for his failure at preventing 9/11. 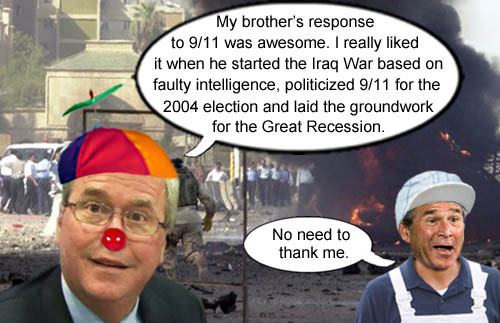 As one could predict, Jeb defended his brother like he’s done this whole election season, saying his brother’s response to 9/11 was ‘awe-inspiring’. Really???!!!! Yes, seeing Dubya sitting there reading ‘My Pet Goat’ to grade schoolers sure inspired us. And then that whole invading Iraq on faulty intelligence of WMDs that resulted in a quagmire with thousands of American deaths and hundreds of thousands of Iraqi deaths, not to mention the rise of Al-Qaeda and now the rise of ISIS to fill the power vacuum left by Saddam Hussein and costing the US over a trillion dollars. And how about how Dubya politicized 9/11 during the 2004 election, literally scaring the sheeple into voting for him. And don’t get us started about his economic policies that just about bankrupted America. WOW! That was awesome! We think that maybe Jeb should join Dubya painting people in the bathtub. GOP Presidential candidate, Jeb Bush, thinks his brother Dubya was an ‘awe-inspiring’ President and an even awesomer painter. Continuing with our zany zealot retrospective…we finally switch to the biggest pain in the world’s rear, Osama Bin Laden, who like Saddam Hussein, was a monster created by the United States. He was one of the Afghan freedom fighters against the Soviet occupation that were much heralded by then President Ronald Reagan. The mastermind of the 9/11 attacks and other terrorist attacks around the globe, and the leader of the terrorist group Al-Qaeda hid successfully in Pakistan, our supposed ally, for ten years until President Barack Obama ordered the attack that killed him last year. BTW, we think President Barack Obama has a right to tout the attack. If Dubya can don an enhanced flight suit, land on aircraft carrier and use 9/11 repeatedly for political purposes for his re-election in 2004, then we have no problem with Obama doing the same. Here’s a photo-toon from our December 5, 2004 issue, when Osama Bin Laden was supposedly hiding in the Tora Bora region in eastern Afghanistan. Last week, Pakistan intelligence sources revealed Osama Bin Laden isn't in Tora Bora in Afghanistan, he is in Bora Bora in Tahiti.